The leather laptop messenger bag is made with beautiful soft leather and durable canvas that is lovely packed and protected with its own cotton dust cover, making it the perfect gift for you oe your loved ones. Its tan genuine cowhide leather gives it a gorgeous messenger bag appearance or a vintage look. This is a unisex leather messenger bag, which means it will look great on pretty women as well as on stylish men. 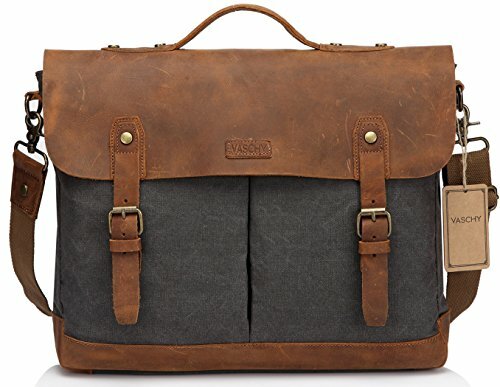 This professional mens satchel may serve as a great business messenger bag as well as an attractive shoulder bag for your life. Both the canvas and the cowhide leather evolve and get better over time.Every scratch is recorded and the marks and the shades will remind you of all the journeys you took, to discover the world and to discover your life. - Premium quality zipper featuring leather zipper puller.The zippers are solid and sturdy. Leather zipper pullers help you have a firm grip so sliding the zipper open or closed is easy. Plus, it feels secure and holds nicely. -One buckle secured pocket at the back to fit your wallet or phone. 1.The Vaschy leather messenger bag is made of superior quality cowhide leather and durable canvas which is soft and smooth touch. The aged cowhide leather comes with a rough appearance due to wrinkles and scratches. 5.With one year Warranty, The Vaschy leather messenger bag is a heavy-duty shoulder bag suitable for those who like casual or can be used as a prefessional business briefcase.It is perfect for students, business professionals or travelers want to make a fashion statement.